We provide fas .pk domain registration in Pakistan. Host'n'Domain.com low cost solutions provides a fast & secure connection to the worldwide Web for Pakistan Web Hosting industry. We offer great domain name registration prices and the best domain name services, giving you unmatched value. 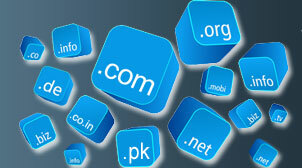 All prices are in Pak Ruppees and are the complete fee to register a domain name. There are no "hidden" fees to any other parties. PKNIC SRS MEMBER, TOP Level Domain, .PK Domain, Register the .PK Domain name in minutes. We are a based on Karachi, but as with online business we provide domain registration to all over Pakistan, our domain registration customers from all over Pakistan and worldwidt including Lahore, Rawalpindi, Islamabad, Peshawar, Quetta, Hyderabad, Sukkur, Sialkot, Bahawalpur etc. Being a PKNIC Full SRS Member, We offer PK Prepaid Card for .pk domain registration and renewal. Price for each PK Prepaid Card is Rs 2200. Every PK Prepaid Card valid for renewal / register .pk domain name for 2 years. HOSTnDOMAIN.com Domain Forwarding service is perfect for people who want to redirect their domain ma,e to other URL or website.We offer both Masked and Unmasked domain forwarding completely free with .com, .net, .org. Prevent un-authorized domain transfer without your approval with DomainTheft Tool. With Domain Theft enabled, your domain names cannot be transferred unless you login to your account and unlock your domain.